Railroads played an important role in the settlement of the Great Plains. Their construction was particularly damaging to the Indian way of life, since railroads helped the military to patrol rapidly along their lines, and villages and farming communities soon grew up along the rights-of-way. The Union Pacific was built across Nebraska between 1864 and 1867. On May 10, 1869, the U.P. tracks joined those of the Central Pacific at Promontory Point, Near Ogden, Utah. Section crews were stationed along the railroad to keep the tracks and telegraph wires repaired. The Sioux and Cheyenne, knowing the importance of maintenance work, attacked working crews. Several such raids took place in present Dawson County. Mrs. Timothy Tobin and Mrs. William Costin, wives of section foremen, and their families were threatened by an Indian raiding party on April 29, 1868. Shortly afterward the warriors attacked and killed Mr. Tobin and section hands Schultz and McCarthy. A third employee named Williams, though seriously wounded, escaped to the section house. Fearing for her husband and his crew, Mrs. Costin bravely set out to warn them of the danger. A passing train picked up the survivors; the two slain workmen were buried near her. 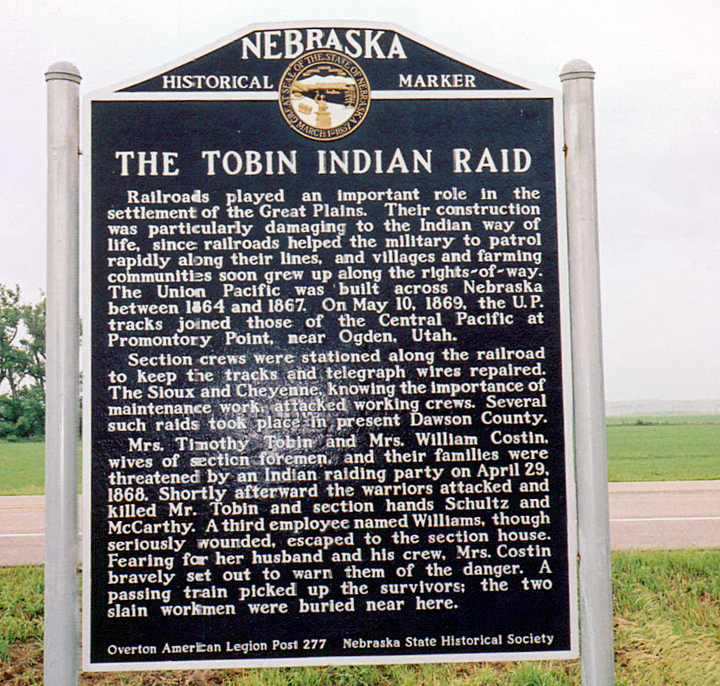 “The Tobin Indian Raid,” Explore Nebraska History, accessed April 19, 2019, https://mynehistory.com/items/show/144.